Early childhood educators are some of the most resourceful people on the planet. Who else do you know that collects so many little plastic containers, bottle caps, and random pieces of styrofoam? This resourcefulness (notice that I don’t call it hoarding) drives my husband nuts. Well, I was very excited to show him that I found a great use for some of those little plastic containers in my closet. Here is a simple activity that you can add to your math center or STEM center. Use some everyday objects and a bucket balance scale to create a fun activity featuring measurement for kids. You can even walk your kids through the scientific method as they learn. The Comparing Weight Activity Printables pictured in this article can be purchased in my store, but you can also do the activity without the printables. I used some of the empty plastic baby food containers that I found in my supply closet to hold my materials. I bet you can get some similar containers by asking your kids’ parents, your friends, or the lady who walks a stroller down your street every morning. If you don’t have baby food containers, you can also use plastic containers that you pick up at the dollar or discount store. Make sure that they are small enough to fit in the balance’s bucket…. and it is best if the containers are all the same. This is the fun part! 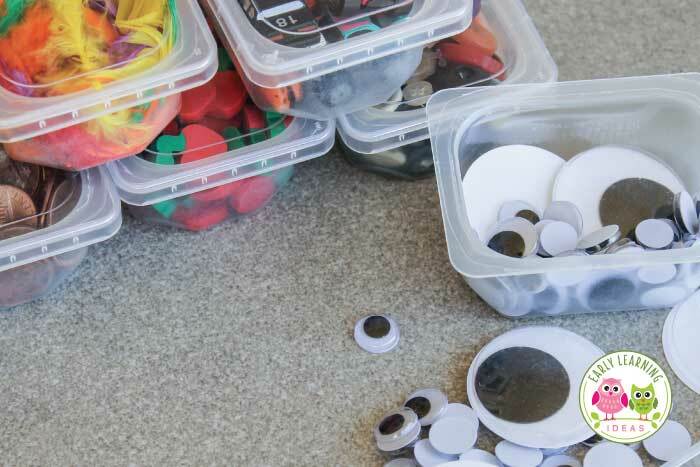 Find random items around the classroom or house to fill the containers. Be sure that the containers have a variety of weights so that they are easy for kids to compare. You can let kids help you with this task. If you don’t want them to open up the containers and spill the contents, tape or glue the lid on them. I used a roll of brightly colored, thin, duct tape or washi tape to tape mine shut. What kinds of materials do you see in the containers? Tell me what you notice about them? Describe what happened when you placed a container in the bucket? What happened when you placed a container in the other bucket? What do you think will happen if you switch them? Why? What do you think will happen when you put this one in? Demonstrate that the heavier object will push the arm or beam of the scale down more than the lighter object. The heavier object will always be lower and the lighter object will be higher. Now, ask kids to select two containers. Before putting them in the buckets, ask them to predict what they think will happen….why? Let the kids take turns placing their selected containers in the buckets of the scale to see if their predictions were correct. Which container is heavier?….and which one is lighter? Were you surprised by the results? Why? Do you think you will get the same results if you weigh them tomorrow? What happens if you put the containers in different buckets on the scale? Do you think the lighter item is heavier than another container on the table? When kids understand the concept of heavier and lighter you can ask them to place the containers in order by weight. Start them out with just a few and then challenge them to compare a larger quantity of containers. Send an empty container home with each child and ask them to fill them up with items from home. Use seasonal or thematic items to fill the containers. Use leak-proof containers filled with liquid. Fill with different amounts of the same liquid to talk about volume or fill with an equal amount of different liquids to talk about density. I hope that you enjoy measuring weights with your kids. Now go dig those little plastic containers out of your closet and start filling them up. I would love to hear what kinds of fillers you use. To purchase the Comparing Weight printables pictured in this article, click on the image below. Below are some items from Amazon that can be used for the activities mentioned in this article. The links below are affiliate links. If you happen to purchase something from link, there will be no additional cost to you, but a small portion of your purchase will be used towards the cost of maintaining this website. Thanks I found a free one and you have given me some great resources and ideas to use it. Thank you for the great idea. I found a balance scale at a thrift store but did not buy it. I saw your post and went back to buy it and it was still there. Lucky me! My students will love it. What a great idea! The materials you used would be interesting for the children. I love that you used the same containers for each item and then sealed them.